Jupiter has had an eventful season; our hive, not the planet. I did a rushed split on April 11 to create the hive now called Ganymede. When Jupiter swarmed anyways on April 25, I caught the swarm to create what has become our new top bar hive Saturn. Ganymede did so well I split her again to share a nuc with a friend. After all this, I was worried that Jupiter might not have a queen, only to find larva and brood about four weeks later (meaning a queen was present). So it seems a report on the progress of Jupiter and her satellites, so to speak, is in order. 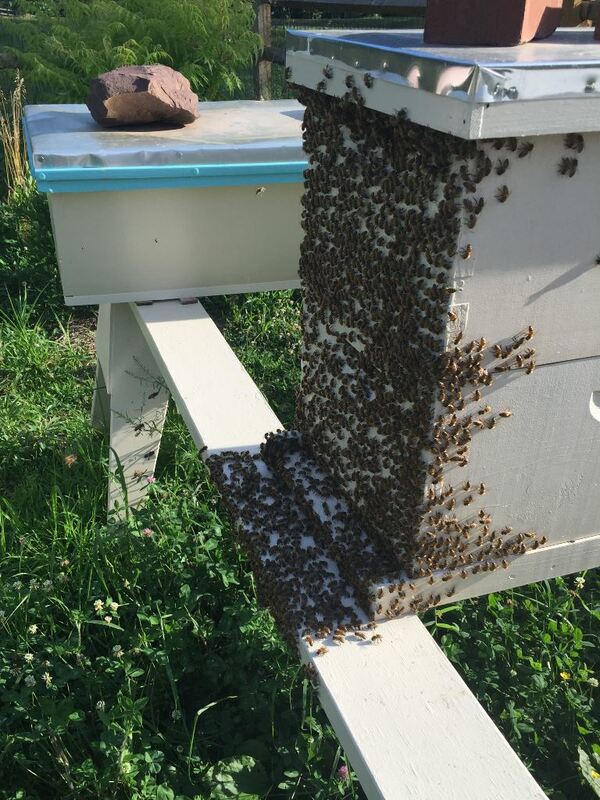 The hives before inspection on June 17. The smoker is lit and ready to go. On Sunday I received an email that the new nuc is doing fine. Kristen was my bee mentor last year, and it was nice to be able to share Ganymede’s success with her. Kristen reported that the queen appears to be mated and laying well. The other hives in the Jupiter family tree are as follows. Ganymede on June 11. The entrance was reduced to 3.5 inches, which might explain the excessive bearding. This hive, named for the largest moon of Jupiter, continues to have a prodigious population. Ganymede has a solid bottom board, which is interesting since my other Langstroth hives (Mars and Jupiter) have screened bottom boards. There is a lot of bearding and external hanging around on Ganymede, presumably to keep the interior a bit cooler. 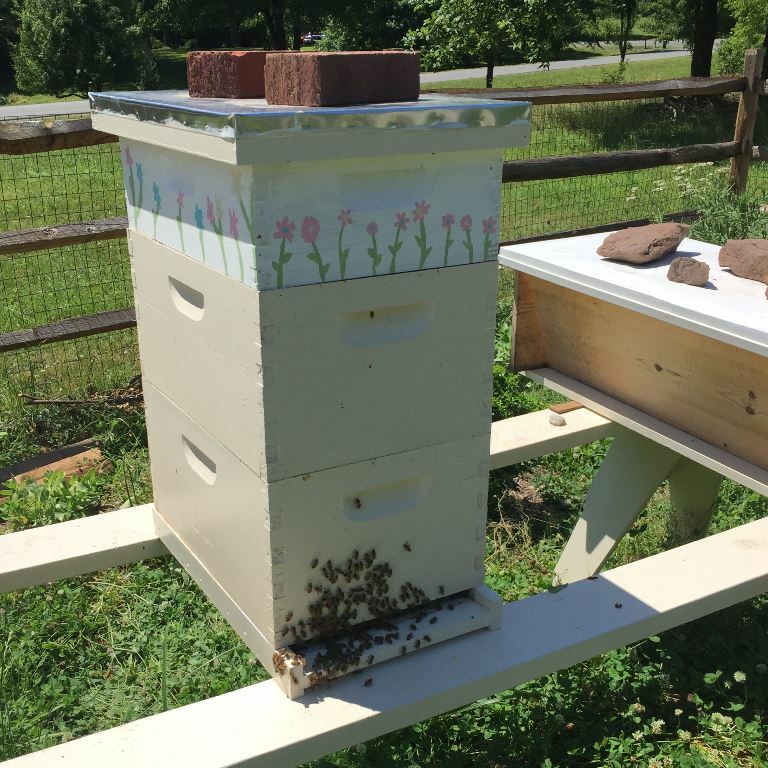 Mars and Jupiter don’t have this issue, as the screened bottom makes it easier to cool the hive. I wonder whether the solid bottom encourages the queen to lay more, or creates better internal conditions for bee production, or if Ganymede simply has a highly productive queen. Either way, the hive is certainly productive. I added a second deep on May 28, and on Friday (June 17) added a medium to provide even more space. Ganymede on June 17, with a full entrance and a new medium on top. Also realized that the hive still had an entrance reducer in place. The other Langs have plenty of air because of the screened bottom, while poor Ganymede is circulating air from the reduced opening. So I removed the reducer to give the bees access to the full entrance. There were a lot of bees, though thankfully rather calm. 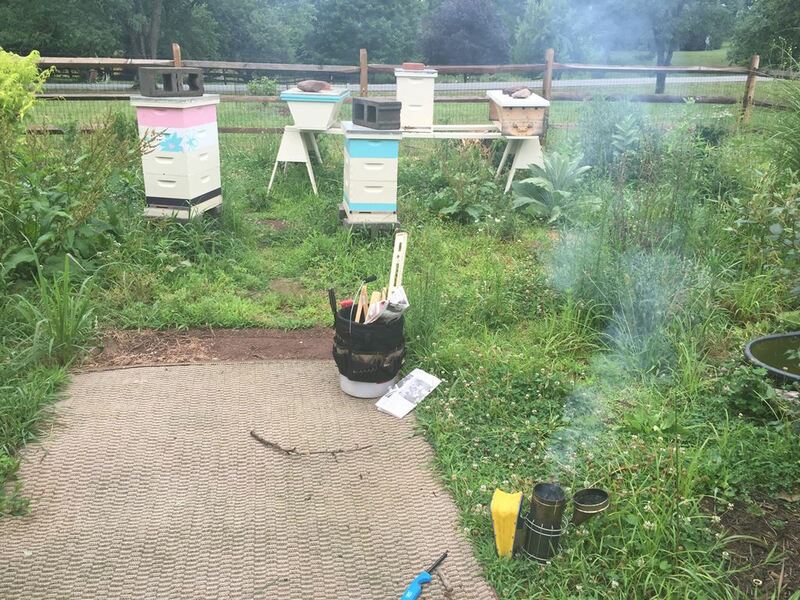 It will be interesting to see what the bees do with the third box, which contains 8 medium foundation frames. It will take quite a bit of nectar to build out and fill up the comb, and it is already mid-June. The nectar supply will likely start to dwindle at the end of the month. This hive received a detailed inspection on Friday, though I didn’t snap any pictures (you can see part of this have in the background of the first Ganymede picture). As you may recall, Saturn has 19 inch bars, so the combs are pretty big. A few are now the full width of the hive and rather heavy. The bees have around 12 bars with built comb, seven (7) of which contain brood. I don’t plan on harvesting any honey from them this year, so the hive seems on track to be ready for winter. Finally, to the hive that started it all. Between the split, a swarm, and a month until the new queen was mated, the population of this hive has dwindled. 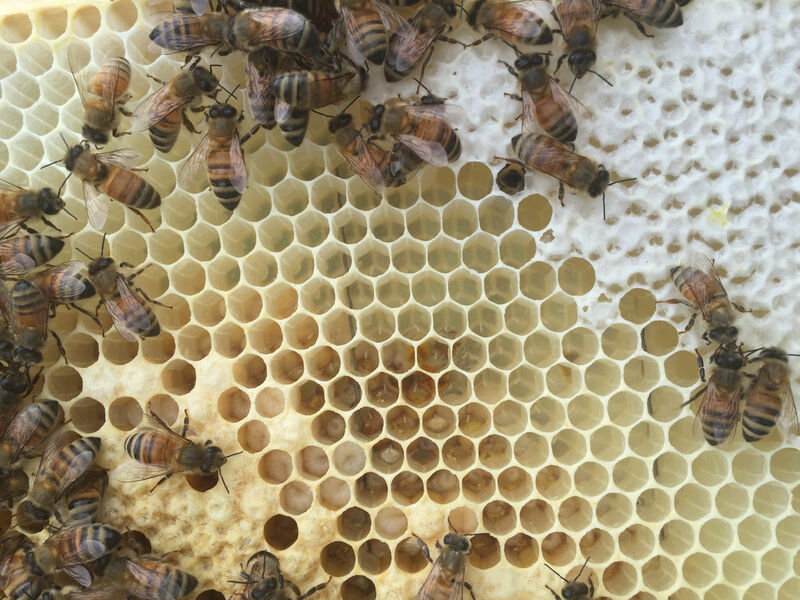 The hive swarmed on April 25, and took about four weeks to hatch and mate the new queen. That was around May 25. Three more weeks before the worker bees hatch brings us to last week. So I expect the population of this hive to start ramping up. It would be nice if the bees filled out their third box as much as possible. I would really like three mostly full boxes for the bees over the winter. The good news is that I saw bee eggs! In over a year of beekeeping I have never found eggs on a frame. I knew they must be there somewhere, and have seen larvae plenty of times. On Friday I spot checked a couple frames in the middle box, and the light and my eyes hit the frame just right. I was so excited I took out my phone to snap a few pictures. If you look closely, you should see the tiny bee eggs just above the larva in this photo. They look like small grains of rice, one per cell. An egg hatches into a larva after about 3 days. The Grammy Award winning song Drops of Jupiter by the American group Train was released in 2001 and written by lead singer Patrick Monahan about his late mother, who died of cancer in 1998. See this link on songfacts.com for more background on the song. The lyrics begin with “Now that she’s back in the atmosphere / With drops of Jupiter in her hair” and the tune came to mind when I excitedly saw bee eggs for the first time. My original intent was to only write about eggs in the hive, the tiny drops from Jupiter’s queen. I started with “Bee drops of Jupiter” then settled on “Now that she’s back in the honeycomb” as a way to reference the queen. I finally realized that our hives Saturn and Ganymede also contained a bit of Jupiter, and expanded the idea to cover the content in the post. With his in mind, the current title fits both the idea of the family tree and the tiny little eggs I found in the hive.